Strong leaders make strong organizations. Montgomery County nonprofit organizations seek great leaders to serve on their boards of directors. Local leaders are eager to lend their expertise to benefit our community. BoardMatch Montgomery, a collaboration between Leadership Montgomery, Capacity Partners and Nonprofit Montgomery, matches prepared, dedicated local leaders who want to serve on a board of directors with Montgomery County’s top nonprofit organizations. More than a database or networking event, BoardMatch Montgomery connects board-ready local leaders with organizations through thoughtfully developed trainings and a high-touch matching process that jumpstarts the relationship between existing boards of directors and board candidates. BoardMatch Montgomery matches your interests and abilities with the needs of our local nonprofit community, so you enjoy meaningful board service opportunities. Serving on a nonprofit board is a great way to gain and hone leadership skills, broaden professional networks, and, most importantly, make a difference in our community. BoardMatch Montgomery teaches emerging leaders and executives the skills necessary to successfully serve on a nonprofit board of directors – and then connects them to nonprofits that need skilled leaders on their boards. Don’t need to be matched – just trained? The BoardMatch Montgomery training also advances the skills and knowledge of those already serving on boards and is available as a standalone educational opportunity. BoardMatch Montgomery helps nonprofit organizations recruit effective and engaged board candidates to serve on their boards of directors. This program is available to members in good standing of Nonprofit Montgomery. To be considered for the matching process, members must attend an orientation to the process held each year in April and October. Please note, the matching process will also include one mandatory interview with the Executive Director/CEO and Board Chair/President. 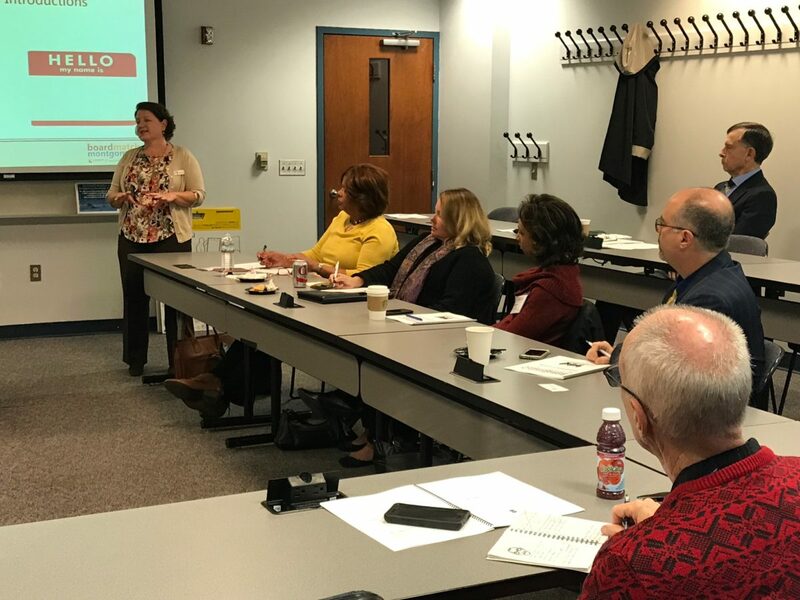 Nonprofit Montgomery and Capacity Partners refresh participating nonprofits on current governance best practices and the curriculum of the candidate training to establish shared expectations and ensure successful board placements. After completing the trainings, candidates and nonprofit boards complete information forms to begin the matching process. Then each candidate and nonprofit executive director and board chair is interviewed by a member of the BoardMatch Montgomery matching committee. Our matching committee meets to identify first and second choice recommended placements. Candidates and nonprofits are notified of the matches and have the opportunity to review and approve the match before being introduced to one another. After BoardMatch Montgomery makes the introductions, the process transfers to each nonprofit’s board nominating committee per their bylaws. Nonprofits should then report back to BoardMatch Montgomery on the candidate’s election to the board. Training and matching opportunities are available to both Leadership Montgomery members and the public. Many employers subsidize these fees as an investment in leadership development, community engagement and good corporate citizenship. If you are currently serving on a nonprofit board and are seeking additional education, our training sessions are open to you as well. Nonprofits must be members of Nonprofit Montgomery and attend the training to be considered for the matching process.